Einstein class was thrilled to be the class with the most Word Wizards since the half-term break, which is an amazing feat. 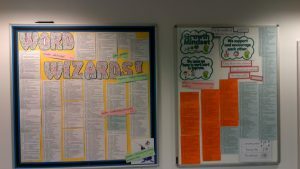 We have now collected, as a class, over 700 new words and in the 3 weeks since half-term achieved 387 new words. Well done to all the class for their continued hard work and perseverance – let’s keep it up and maintain our champion status – only 15 so far this week so please bring more in! ← Year 5 Dyson: Another great PE lesson!